Last year, I created a colorful eye makeup for Diwali and this year I wanted to do something different. Since neutral or smoky eyes with bold lips are doing the rounds, I wanted to try out that look for this Diwali. I created an easy halo smoky eye look which would be perfect for both day and night time. As for the lips, I would suggest a light colored or slight bright lip color for daytime and the bold dark version for the night time. While writing the post, I just realized it is sort of a Get Ready With Me (GRWM) in pictorial style. So I really hope you guys would like it. Also, I bought several new products last month and wanted to try out few of them in this look. 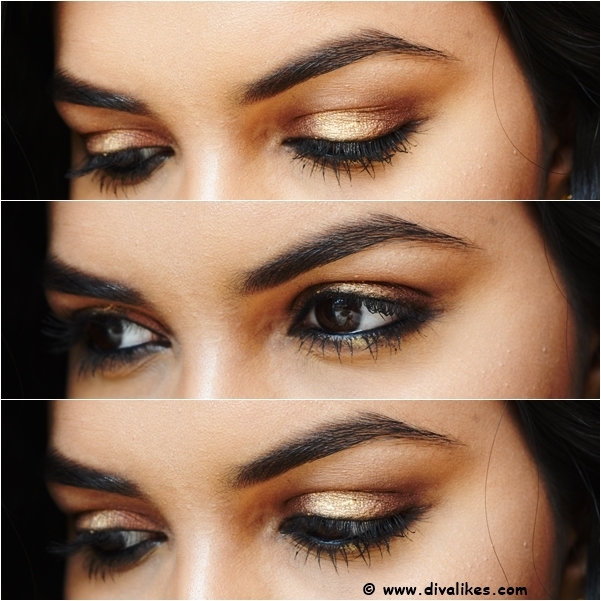 Scroll down to see the step by step Diwali Makeup Look that I created for this year. I started off with a good moisturizer for my skin. Of late, I am loving facial oils as the weather is drying, I used the Life-Flo Pure Rosehip Seed Oil and let it sink in for 5-10 minutes on the skin. It makes the skin supple and glowing. Festive makeup needs to be worn for long and since you won't get a proper touch-up time, it is good to use a good primer for the skin. I prefer the Nivea Men After Shave Balm as a primer. As you all know it is quite a popular one, raved by the makeup lovers. I applied it with the help of RT Expert Face Brush. Next I started off with the eye makeup. I applied an eye cream to moisturize the area. I applied the Kryolan Derma Color Camouflage Cream as a color corrector to treat my heavy dark circles. Next, I set it with the Ben Nye Banana Powder. It has a yellow tone and cuts down blue or purple shadows. I applied the Rimmel Scandaleyes Eye Shadow Stick Bad Girl Bronze all over the lids and smudged the harsh lines. Using a bronze shade from the Sleek Au Naturel I-Divine Eyeshadow Palette, I patted the color on top of the previous eyeshadow. Using a clean fluffy brush, I blended everything to remove any harsh lines. I applied the Maybelline New York Fit Me Concealer on the brow bone to highlight. It is lighter than my skin color and brightens up the high points well. I blended everything and applied a white matte eyeshadow on top. Next, I used a gold pigment (MAC Old Gold Pigment) and applied only to the center of the eyelid to create a halo effect. With a clean brush, I again blended everything to merge the gold color with the bronze. Next, I applied the color corrector (peach and yellow) and concealed the dark circles under my eyes. Moving on to the face makeup, I applied the L'Oreal 24H Infallible Liquid Foundation with the help of a flat foundation brush. Once the foundation was applied, I blended everything with the YBP Makeup Perfector. Take time to blend the foundation well and avoid applying under the eyes if you are going heavy on the concealer. Next, I applied the Maybelline New York Fit Me Concealer under my eyes, bridge of the nose, cupid's bow and chin to highlight. Also, all of these were blended well with the YBP Makeup Perfector. Next, I baked my face. Using my RT Sponge (damp), I dipped it in the Ben Nye Banana Powder and applied a thick layer under the eyes, bridge of the nose, below my contour, cupid's bow, and chin to highlight. Since it was a festive occasion, I first applied the LA Girl Pro Concealer Toast and blended it. Further, I added the L'Oreal Mat Magique Compact Powder with a narrow brush and blended the contour. Once the face is done, I moved back to the eye makeup. I applied a thick layer of kajal (Sugar Cosmetics Back to Black Stroke of Genius Heavy-Duty Kohl) and tight lined my eyelids. I took a smudger brush and smudged the kajal to the lower and upper waterline slightly to give a smoky look. Taking the gold pigment, I applied it slightly on the middle of the lower lash line as well. I used the Sivanna Shimmer Highlighter and applied on the high points of my face and brow bone. Lastly, I used the Makeup Revolution Pro Fix Fixing Spray to take off the cakey off and give a slight fresh effect on my makeup. Since the mascara was left, I applied the Maybelline Lash Sensational Mascara once the spray dried down. For the lips, I mixed two colors. I wanted something bold but not red or maroon. So, I applied the Maybelline Color Show Lipstick in Nutty Cookie which is a true brown color. Next, I topped with the L.A. Girl Matte Flat Finish Pigment Gloss Rebel which is a dark purple. The color I got is a brownish deep berry sort of. In person, it was looking pretty dark. And here is my Diwali look for this festive season! I really hope you guys liked the look. Please let me know in the comments below. And, Happy Diwali in advance!